One of the greatest joys of being a dog owner is spending time outdoors playing with your furry friend. Yet as the temperature starts to drop and the ground is covered with snow and ice, this becomes less enjoyable. Regular exercise is a vital component of your dog’s health, so it’s important to find ways to get out there for fresh air even on the coldest days. The following are a few tips to keep in mind to make sure your dog stays active, healthy, and safe in cold and snowy weather. Take your dog along when playing winter sports. Some dogs are perfectly happy venturing out into the snow. You can bring your dog along when taking part in winter sports to ensure that your pet gets plenty of fresh air and exercise. Many cross-country ski or snowshoeing trails are dog-friendly, for example. If you do take your dog along for a day outdoors, be sure to take frequent breaks and provide plenty of water. Dogs need to stay hydrated in colder months too. Look for an indoor play space. If the temperature has plummeted and you prefer to stay out of the cold, you might want to look for an indoor play space to keep your dog happy and engaged until it starts to warm up. Many towns have indoor dog parks, but if not you could also check out the facilities at local doggie daycares. Another option is to sign up for an agility class that runs throughout the colder months, which will help keep you in shape alongside your dog. Create your own obstacle courses or other games. If you have room in your own home, you can forego the agility course and create your own obstacle course for your favourite pet. Play games like hide and seek with treats, or build a fort out of chairs and blankets for your dog to navigate through. If you have small children, they will love taking part in the challenge as well. When you do take your pet outside for a walk, you’ll want to make sure that he is as comfortable as possible. Dog clothes are particularly useful for shorthaired breeds, which have little protection from the elements. 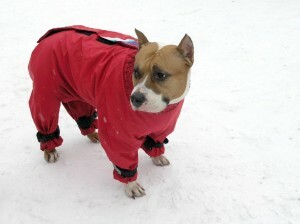 Dog boots can help protect their feet on cold and icy surfaces, as packed snow or ice can cause frostbite or cut their pads. There are a number of stylish dog sweaters and jackets to choose from. You can check out these dog coats with Dogs Corner to get an idea of what the different options are. In addition to cold surfaces, salt can also do a number on your poor dog’s feet in the winter months. Many homeowners put salt on their walkways to help melt the snow, but this can get into the dog’s paws and cause burning or irritation. Beware of antifreeze on walks as well, which a dog might lick off of his paws. This can lead to severe illness, so you’ll want to be aware of where you’re walking and be a bit more cautious in the winter. With the right cold-weather gear and a plan B for bad weather, you can keep your dog active no matter what the season. Making the time for exercise will keep your dog happy, healthy, and in top shape when spring rolls around.